If the measure is successful, Los Angeles County would be following in the footsteps of New York and a handful of other municipalities nationwide that already have implemented calorie counts on the menus at major restaurant chains, or are taking steps to do so. The California Restaurant Assn. does not oppose the measure, although it has concerns about how it would be carried out. "We understand that consumers want it," said Jot Condie, president and chief executive of the organization, which represents 22,000 chain outlets in the state. 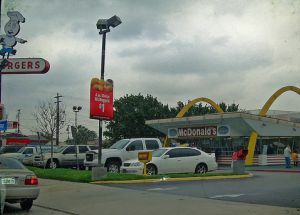 But he said it should be up to restaurants to decide how best to make this information readily available to consumers. He said he also wants to see a uniform policy applied throughout the state to cut down on retailer and consumer confusion. Calorie counts and nutritional information have long been available on all major fast food websites: at the McDonald&apos;s website, you can create custom meals and have a web application spit back exact calorie, fat, and sodium counts (a hamburger, medium fries, and iced tea? still about 630 calories). There are other independent websites like Chowbaby handy to the consumer who wants to do some nutritional research before placing that lunch order. The question, of course, is how extensive these requirements would be. Of course places like McDonald&apos;s, Burger King, et al, would fall under this new rubric, but what about Baja Fresh? Chipotle? Panera? Denny&apos;s? A Baja Fresh vegetarian bean & cheese burrito is far from a healthy choice: 850 calories, and 31 grams of fat. But does the public at large realize that their perceived "healthy choice" might actually be a nutritional nightmare? And what harm would it really do to post these numbers? The public will either accept their fat fates, or they&apos;ll begin to make smarter decisions about the foods they choose to purchase, which will then push fast fooderies to provide more healthy choices. It might just be a win-win. Photo of original Mickey D&apos;s by turkeychik via Flickr.